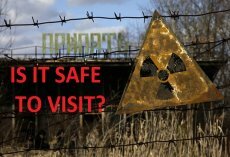 Today Chernobyl guided tours can be found on different websites of local and international tour operators. As the level of radioactivity is fine and the territory was strongly cleaned after the Accident it is not surprising people are attracted to visit the site. But as visitors came from different countries guides are often struggling to explain what was the reason of the tragedy, what were the peculiarities of Soviet life. Many tourists appear to be totally unaware of the fact that Chernobyl is not a location from the game but a real place of nuclear catastrophe from far 1986. Big tour operators have quite a number of trained guides who know safe passes, have deep knowledge of the history of the place and speak English fluently. But there are also individuals who provide guided services by their own. One of them is Petr Philon - the teacher of physics from Gomel, Belarus. He is very enthusiastic about his unusual hobby. He makes constant tours to legendary in some way Pripyat city and surrounding areas. Petr was one of the first men in Belarus to start making guided tours to Chernobyl Zone. On the one hand, he had the idea to create business connected with the physical activity, something distinctive, one-of-a-kind so to say. On the other hand, he is a physician who spent years studying the Accident and its consequences. And when it clicked together it was obvious that tours to contaminated zone will be popular. As for the payment, Petr admitted that tour guidance is more like an extreme hobby and there were times he was paying for a bus or for entrance orders on the entrance posts to the Zone. But he was never upset about it as every tour he's doing with great pleasure and he tries to organize everything the best way possible. Most of the visitors are young people but there are also those who made 4 or 5 visits to the Restricted Area with a Belorussian guide. He is now also making guided tours to one of the most mysterious sites hidden Soviet military base known as Duga-3 or ‘ Russian Woodpecker”. If one would like to organize tours he or she should, first of all, get a permission from State Agency of Ukraine on the Exclusion Zone Managemen and it’s now known to be more complicated than 5 years ago.